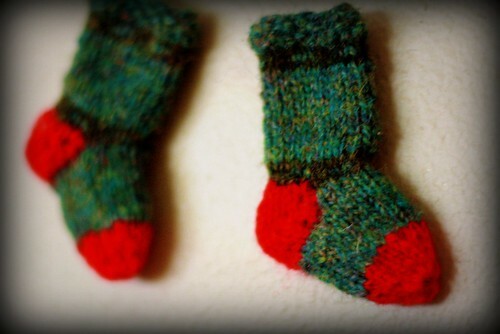 mini stockings, knit about 4 years ago! I hardly feel ready for Advent and Christmas. My mind is still on those Martinmas sweaters! But today I was looking through the December issue of Martha and thinking ahead a bit to what I hope this December will look like in our home. I'd like to create (and maybe buy, too) some new, special decorations. (We haven't gotten any new decorations, besides ornaments, since before having kids. Yikes.) I'd like to try some new-to-us baking and cooking projects. I'd like to find some new holiday tunes (suggestions? we have tons, but it's all kind of old -- we need to freshen it up!). I'd like to keep the house in order so that we can spontaneously invite friends over for drinks or crafting or play. I also liked this idea and may try to incorporate something like it into our celebration. With those thoughts in mind, I'm beginning to look ahead to the basic outline of our December days, and how our Advent traditions can be used to foster the kind of season I hope to create for my family. I try to parent and live intentionally, and I think the way we choose to celebrate can be a very concrete place to work with this intention. This time of year is, for me, a good time to take stock in the choices I make on a daily and seasonal basis, and the gifts that I hope to give my children, beyond what they'll find in their stockings on Christmas morning. Our Advent calendar tradition was born out of this desire, to spread out the season, to keep things from becoming overwhelming, overstimulating, and overdone. I have links today to point you in the direction of my Advent posts (still my most frequently searched posts, for better or worse!). As I said last year, I hope that you all receive these posts in the spirit that I offered them -- as a help for simplifying the holiday season by drawing it out. By not allowing it to get out of control with doing and buying too much, but paring it down to the essentials, the things that make this time of year really special for you and your family. Please don't take my suggestions as yet another thing to pile onto an already overfull month. The last thing I would want is for you to be burdoned with guilt about needing to add a complicated new tradition to your life. But if it helps you to have some structure, and gives your family a joyful way to celebrate, then I hope my suggestions are helpful to you. So, for your searching convenience, here are the links!